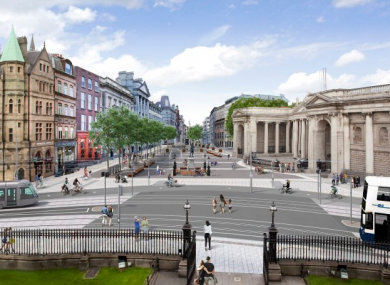 DUBLIN CITY COUNCIL is considering the closure of College Green for a series of summer events to showcase the potential of a pedestrianised plaza in the area. Council officials are discussing the possibility of closing the thoroughfare between 7am and 7pm on an unspecified number of Sundays in July and August. The pedestrianised plaza was first proposed in 2016 and sought to ban all traffic in College Green, before being rejected by An Bord Pleanála last year over traffic concerns. However, Brendan O’Brien of the local authority’s Traffic Department told a meeting of the Transport Committee this afternoon that a series of summer events would allow people to see “what College Green can do”. Independent councillor Mannix Flynn suggested that such events would not accurately show what a pedestrianised College Green would look like. “Just present it as a plaza and see how it works out rather than having something like free ice creams,” he said. “Because you’re going to get a crowd for free ice creams, there’s no question about that. Fianna Fáil councillor Frank Kennedy disagreed, saying the proposed summer events would show the public what the council was planning. “What Dubliners want to see is this idea at its best, so we can make a proper assessment of what it’s going to be like and [see] the benefits that are going to accrue from it,” he said. Separately, O’Brien confirmed that the council would make a new application to pedestrianise College Green, and said officials were currently assessing traffic in the area in conjunction with the National Transport Authority. A judicial review of An Bord Pleanála’s decision to reject planning permission for the plaza, which has been brought by a third-party, will be heard at the High Court tomorrow. Email “'We want to see it at its best': Dublin City Council plans closure of College Green for summer events”. Feedback on “'We want to see it at its best': Dublin City Council plans closure of College Green for summer events”.